Today, our intrepid watch wariors are testing the latest in 'tin-can & string' tech recording devices. With can in hand, they spoke on Jean-Claude Biver Step Down As CEO Of Hublot, Ochs Und Junior Selene Tinta Watch, John wears a watch in a WiMM, IWC Pilot Chronograph Top Gun Miramar Watch and the start of SIHH. Hot stuff. 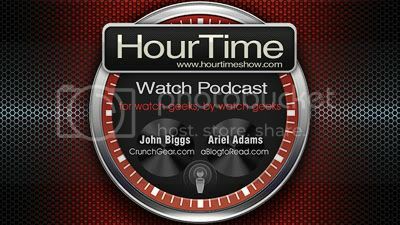 John Biggs and Ariel Adams talk about the lure of tourbillons, watch pet peeves, and some hot deals. There's even a contest! Ariel and John talk about a $500,000 sports watch, the history of communist watches, and our first watches. John Biggs & Ariel Adams - two big personalities online. This is our opportunity to share our expert thoughts with you on the latest and greatest developments in your, and our, love of watches. What makes us experts? John Biggs has been doing this for years and has been reporting on watches, tech, and gadgets for ten years. His is a voice listened to by many, and he brings the collective experience of a professional gadget critic and a savvy consumer. In addition to his watch blog WristWatchReview.com, John is the editor of CruchGearand writes for the New York Times and a number of other publications. Ariel Adams publishes aBlogtoRead.com, the most popular watch blog online. He is the resident watch expert writer at Luxist.com, reviews watches for AskMen.com, provides news articles to WatchUSeek.com, is a luxury style writer at Examiner.com, contributes watch content elsewhere, and can’t stop talking about watches.